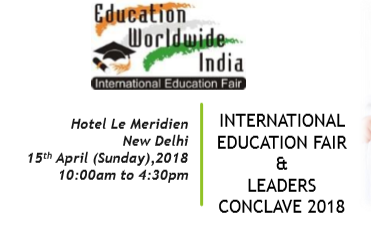 New Delhi: Education Worldwide India Leaders Conclave 2018 is being organized on 15th April 2018 at Hotel Le Meridien, New Delhi. During this conclave, eminent speakers and panelists will emphasize on issues that are extremely important in positioning India as a promising destination for education. 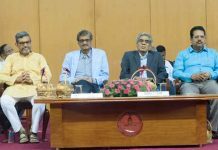 In order to promote Study in India, our education system requires major transformation. It would be crucial for us to understand the important factors that can help in Globalization of Indian Education. Ratings, Rankings and Accreditation’s plays a vital role in projecting any country as a ‘study abroad destination’. Innovation in Education System is another important factor that will help in overall quality and competitiveness of Indian Education. We at the fair and leader’s conclave will touch upon the topics of importance to raise Indian Education to global standards and how we can achieve it. Hon’able Chairman AICTE – Shri Anil D Sahasrabudhe Ji has given his consent to be the Chief Guest of Education Worldwide India – Leaders Conclave 2018. This conclave is being organised by Global Events & Expositions Private Limited, one of the leading Education Promotion company for last 15 years in India and is slated to bring a change and throw some light on important topics in the education Industry. Along with the conclave, GEEPL is also organizing an India International Education Fair with about 30 Institutions participating from India & Abroad.